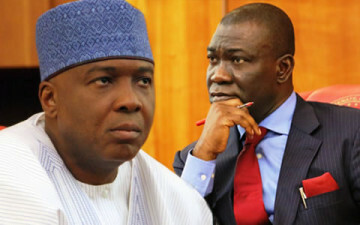 The Senate yesterday expressed its strong opposition to the move by the federal government to charge its President Bukola Saraki, his deputy Ike Ekweremadu, the immediate past Clerk of the National Assembly Salisu Maikasuwa and the Deputy Clerk Benedict Efeturi to court on allegations of forgery of the Senate’s Standing Orders in June 2015. It also raised the alarm over the attempt by the executive arm of government to truncate Nigeria’s democracy by attempting to cripple the legislature in its desperate bid to forcefully change the leadership of the Senate, and warned the federal government not to mistake its maturity and the hand of cooperation that it had extended to the presidency as a sign of weakness. The Senate Standing Orders 2015 was alleged to have been forged by some principal officers of the Seventh Senate in collusion with the management of the National Assembly ahead of the June 9, 2015 elections of Saraki and Ekweremadu as the Senate President and Deputy Senate President respectively. The document was allegedly forged with the intention of changing the Senate’s rules for the election of presiding officers of the chamber from the open ballot system to the secret ballot system. The alleged forgery was said to have been brought to light by some senators who cried out that going by the order on voting, they were unable to vote for their choice of presiding officers because of party leaders who would have monitored the elections to know how they voted. The forgery was therefore allegedly done to hide the identities of senators during the elections. Although the Nigeria Police launched an investigation into the allegation of forgery of the Senate rules, nothing was heard of it until last Friday, when Saraki, Ekweremadu, Maikasuwa and Efeturi were charged to court for forgery, after an earlier invitation had been sent to Ekweremadu, former Senate President David Mark, former Senate Leader Victor Ndoma-Egba, former Rules and Business Committee Chairman Ita Enang, Maikasuwa and Efeturi. A statement issued by the Chairman, Senate Committee on Media and Public Affairs, Senator Aliyu Abdullahi, alleges that this is being done by the executive to cause leadership change in the National Assembly and in the process bring about a return to the era of impunity and lack of respect for due process. While appealing to President Muhammadu Buhari to call the Attorney-General and Minister of Justice, Mr Abubakar Malami, to order, the statement says that Nigerians have had enough economic hardship at this time requiring the full attention and cooperation of the three arms of government, instead of these attempts to distract and politicize governance. “It is clear that the Attorney General and party leaders behind this action either lack the understanding of the underlining principles of constitutional democracy, the concept of separation of powers, checks and balances and parliamentary convention or they just simply do not care if the present democracy in the country survives or collapses in their blinded determination to get Saraki and Ekweremadu by all means necessary, including abuse of office and sacking the Constitution of the Federal Republic of Nigeria. “We are in a state of economic emergency such that what the National Assembly needs at this time are executive bills and proposals aimed at resolving the crises of unemployment, currency depreciation, inflation, crime and insecurity. “What the National Assembly needs now are executive bills to build and strengthen institutions to earn revenues, fight corruption and eliminate waste. Senator Abdullahi said that if the legislative branch falls, democracy fails as there will be no other institution empowered by the constitution to check and balance the enormous powers of the executive branch.